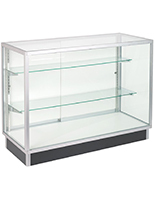 These commercial glass display cases are great for selling jewelry, collectibles, antiques and other curios with their high visibility design. 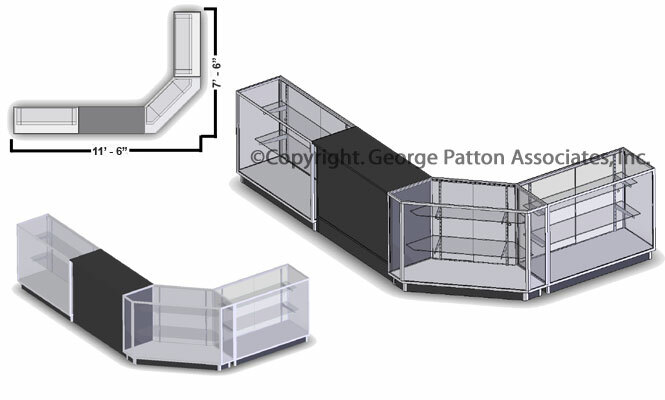 The retail showcase sets include four pieces: two counters, a corner and a black register stand. Units in the glass display cases feature locking sliding doors for safely storing valuable curios. 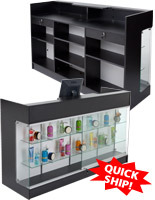 In addition, the counters and corner showcases feature adjustable shelves to accommodate different sizes of merchandise. 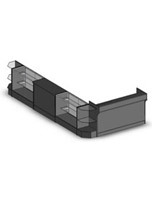 The retail display cases feature a silver finish while the register stand is a neutral black. The neutral style of the cabinets with sliding doors will fit in specialty shops, department stores and any other commercial outlet. 138.0" x 38.0" x 90.0"